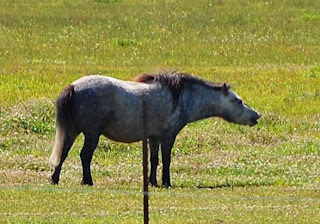 The other morning the kids and I looked out to see a little impostor to our herd. Way cute little Dabble gray huh? He was just chilling and eating some grass. Now, as of the night before when we put the horses to bed, I knew he wasn't out there. Then the next morning, there he was. We think he might have gotten under the fence. How much do you love that forelock? It's so cute!! 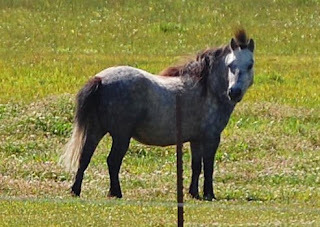 Now, this dabble gray horse is not like our other horses. He is a mini. And a fast one at that. 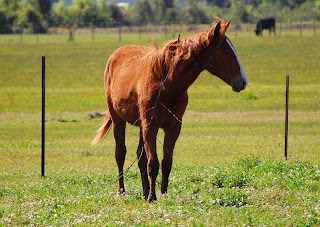 The geldings in the pasture tried to chase him away from the mares and that little bugger can FLY! Oh, and one more thing about him. Can you guess what? He is a stud. Good thing those legs were only about a foot tall. All our mares were too tall for him. Sorry bud! The kids and I wanted to see if that cute little guy would come and eat some carrots. So, we walked out to the fence line and tired to call him. Yeah, he wasn't so interested in our carrots. But Missy, our yearling, wanted to see what we were doing. Do you notice anything strange about Missy? 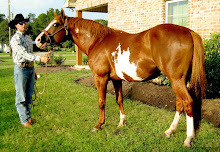 Besides the fact that the filly won't shed out no matter how much dewormer I give her or how much I try shedding her. 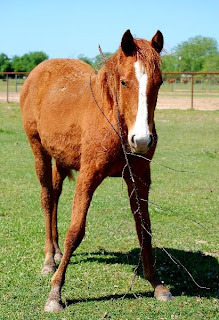 The poor girl had a stick stuck in her mane. I am not sure where she got it from because we don't have any trees in our pasture. It was a pretty big one too! She tried to walk with it. But it would poke her. So she tried a different tactic. 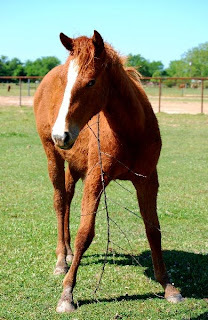 She tried to lower her head and walk with the stick. But that didn't really work either. I thought she was being incredibly calm considering the situation. She was trying to figure out how she could walk with this huge stick stuck to her neck. So, I decided to venture out in my PJ's and flip flops to save the day. "Hey, do you think you could help a sista out?" Missy is very smart considering I have not really worked with her. 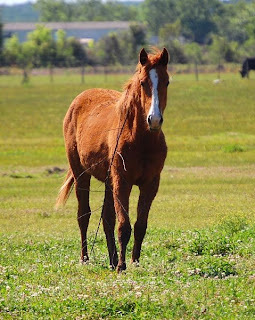 I have only tied her a handful of times and only lunged her about four times. But she is really sweet and wants to do what is right. "Just take it out of my hair, okay?" So, with my big huge black camera in tow I tried to take that stick out of her mane. The stick was full of prickles. It got me a few times. No wonder she didn't want to move at all. Those things hurt. She was glad it was out and stayed around for a few rubs from me. Then she walked off to eat some more grass. With that little man. Now you can see how small he is. While I was getting the stick out of Missy's mane, the kids were busy entertaining themselves. I am not sure if the horses will eat those. But it was a good idea anyway. 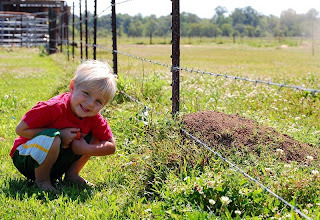 While along the fence line we spotted some super huge fire ant piles. That was one of the smaller ones. Those ants are mean too. They are everywhere here. When it rains they float around in the water that stands in the yard. Mean little ants. 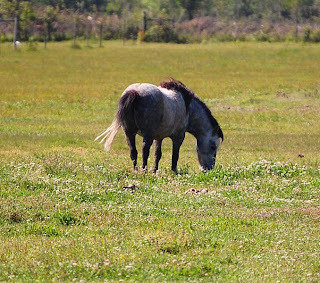 The little dapple gray mini stud got to spend the night in the pasture . We couldn't catch the speed demon. His owners came and got him the next day, to go back to his side of the fence. I am glad our mares are pretty laid back and non confrontational with new horses. I rode Ozzie yesterday in my English saddle. He was wonderful. Well, I just rode him in the round pen. But we walked and trotted and worked on keeping the same pace. We did a lot of serpentines. He even did well with Cowpokette screaming and hanging off the round pen fence. She wanted to ride and was so mad when I told her no. I am going to ride in the round pen until I feel comfortable. I am hoping that will only be a week or so. Then I will venture into a bit larger side pasture, and then I will go into the HUGE 150x200 arena. That is just too much room for a green horse to take off running in. Baby steps. 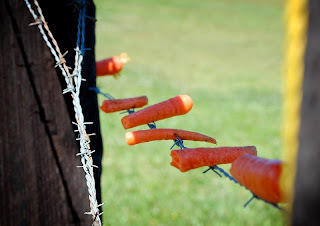 The carrots on the barbed wire cracked me up. I'm sure you and Ozzie will build some trust in each other over time. No rush. I was looking at a picture of a mini the other day and thinking about how the fencing must be customized much lower, and then I read your story of the little trespasser. Too funny. 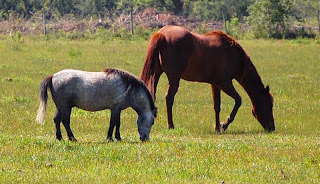 Let's just hope the mares decided to keep standing and not lay down, LOL. I have a friend who had a mini stud and used to break out and take flying leaps at the mares to try and breed them, Too funny! Hmmmm.... about the yearling - time for a vitamin B shot? love the carrots on the fence! What a cute little stud muffin. Love the carrots, I bet they get picked off the fence. 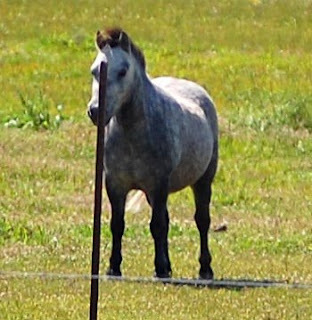 Maybe you should consider posting "No Trespassing" signs at mini-horse height? lol! What an adventure! Sure hope none of those mares were in heat. 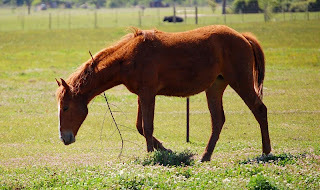 I watched a couple of YouTube videos a while back of mares getting bred by minis and ponies.......the mares spread their back legs to lower their hind ends to make it easier for the mini to mount them. And the other mini was mounting a mare when she was laying down. Crazy stuff. Studs never know there true size...well any male at that! LOL Glad the ride on Ozzie went well. Carrots on the fence made me laugh. Very creative. lol the carrots! Did they actually leave them there for the horses to eat? That stick is too funny! Where in the world did it come from? Did that little mini bring it in? Good for you for getting on Ozzie! That little mini is a porker, isn't he? enjoy ozzie, take it slow and be comfortable with what you do, you'll have a blast with him i'm sure ! The mini was too cute- though im not sure what Id do if I woke up to one extra mouth to feed! the kids were creative with the carrots, I'm sure the horses appreciated their efforts. Glad you had a confidence-boosting ride on Ozzie! Please update soon. Your FB comment has got me so worried about you, my friend. Are you ok? Did you have to go to the hospital? Please update and let me know you're ok, alright?? Oh my! What a cute little guy! Loved the carrots on the fence! LOL! 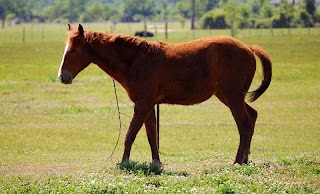 On the shedding out problem, our old horse sometimes will hang onto his coat like that and I've used vegetable oil in his feed and it works like a charm! I would use about 1/2 to 1 cup every other day or so. It's inexpensive and works. Good luck! Pedro is hanging onto his and I'm fixing to start the veg oil treatment with him! That mini is the cutest thing EVER. And the carrots on the fence is brilliant. Funny how the littlest guys have the biggest attitudes! I think your farm needs another mini stud. We'll send Poncho out on the next plane. Sound good?? 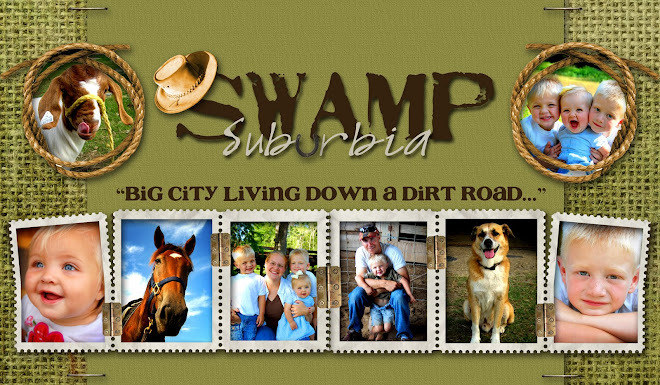 i found your great site totally by accident. 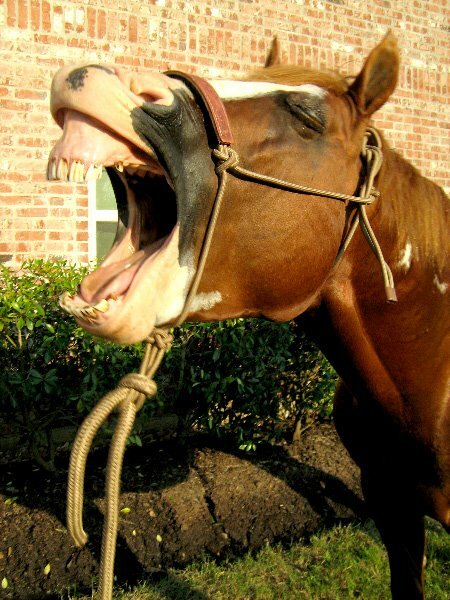 i just wanted to add that, on my first "hack" in the english countryside, i was riding behind an irish cob with the huge mane, feathering on the legs and tail down to the ground. poor thing was gathering bits of mud, twigs, leaves and thorns as we went. then he got this really big stick stuck in his tail and just dragged it along. he was such a sweetie, he just put up with it till someone removed it.